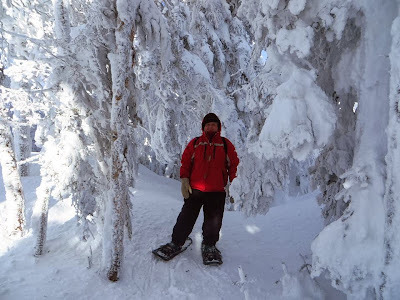 Of all the reasons Teena and I came to Mont-Tremblant, the main one was to go snowshoeing. 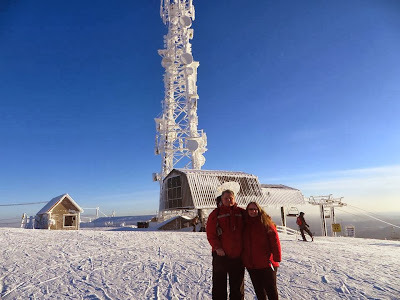 It was freezing cold this morning when we took the gondola up to the summit. This is without the windchill and there was a good wind blowing! It is about a five minute gondola ride to the top. As you can see, the village is very proud of alpine world cup skier and home town boy Eric Guay, who now has won more world cup medals than any other Canadian. It's cold up at the top of the mountain! The second picture is looking down the mountain. At the time, there was a frost haze in the air. That's why you see nothing behind it! Teena and I on the trail. The light kept changing during the day which is why there is a difference in the colour quality. Lots of frozen snow filled trees. It was beautiful and more stunning than these pictures. We found some frozen berries along the trail. The only color in a snow covered land. Yet another tower? Teena sure looks cold. Looking back at where we started from. After a great day it's back down on the gondola. It was a sensational day!